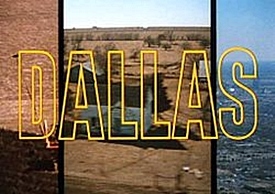 Dallas was a prime time soap-opera pure and simple and to try and explain the plot twists and turns over a fourteen year run would be impossible. Let me just say that the show was set in Dallas and chronicled the exploits of wealthy Texas oil millionaires and ranchers. 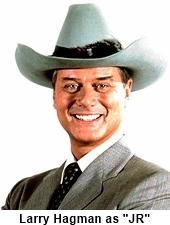 Many of the plots revolved around the shady business dealings of JR Ewing (Larry Hagman) and dysfunctional family dynamics. 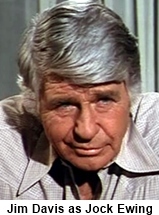 The Ewing’s were the central characters with Jock Ewing (Jim Davis) being the family patriarch, his wife Miss Ellie (Barbara Bel Geddes) their oldest son JR, middle son Gary (Ted Shackelford) and the youngest was Bobby (Patrick Duffy). The plots usually involved JR swindling or cheating his way through some business deal while the rest of the family certainly did their parts to maintain complete chaos in the various households. A lot of the family friction came from the wives. Sue Ellen (Linda Gray) an ex Miss Texas was unhappily married to JR which caused her to drink… alot. Youngest son Bobby married Pamela Barnes (Victoria Principle) who was the daughter of the Ewing’s biggest rival and ex-business partner. Note that Pamela’s Daddy was Miss Elies first love that Jock stole away from him then cheated him out of half of the oil company later called Ewing Oil (I told you it would be impossible to explain it all!). Plot twists and turns were the norm and not the exception and there was usually a huge cliff-hanger at the end of each season. The biggest “wait until next season” ending was when JR was shot in the season three finale. Other season finale cliff-hangers include the finding of an unidentified floating female corpse in the Southfork swimming pool (season four); a blazing house fire (season six); and Bobby’s death (season eight) and subsequent return (season nine). Whew!! 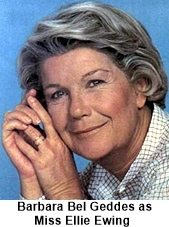 Actress Barbara Bel Geddes suffered a major heart attack in 1984 and missed half a season recuperating. When she did return she found the work too be to strenuous and quit the show(some say however that it was because of a dispute over salaries). Whatever the reason, Donna Reed (The Donna Reed Show) was hired to fill the role. After Reed’s first season ratings declined and Bel Geddes thought that she should return. The producers agreed and promptly fired Reed who in turn sued them for breech of contract. She was awarded One Million Dollars in an out of court settlement.